Many companies today have been around for several decades or more. When these companies were started, they implemented processes that worked then and for the most part, still work today. They keep doing things the same way without change simply because they have always done it that way, the “don’t fix it if it is not broken” principle. The problem is that the business world isn’t the same as it was a few decades ago. With recent advances in technology and communication came changes in the way we do business. Today we do business in a world market and parts and supplies are commonly sourced from around the world. Competition for business just keeps increasing. Companies must look for ways to reduce waste and improve product quality to remain competitive. Lean methodology is very effective at eliminating and reducing waste. Many organizations from manufacturing to healthcare have successfully implemented Lean methodology. They have benefited through increased productivity, elimination of waste and improved quality resulting in a positive impact on the bottom line. Regrettably, many organizations have yet to discover the value of Lean methodology. Lean is the act of reducing waste and adding customer defined value to products and services. The definition of Lean tends to vary slightly depending upon the source, nevertheless the underlying meaning is the same. In the United States, the predominant thought is that Lean is a system of tools and techniques for reducing waste and adding value in every process. In Japan, Lean is considered a mindset and not a set of tools. The fundamental principles of Lean methodology are based on eliminating all forms of waste and increasing customer perceived value with everything we do. In addition, management must support and encourage the Lean mindset throughout the organization at all levels. Lean means doing more with less while doing it better. By continually identifying and eliminating waste in our processes, we can lower costs and increase margin. Lean, done properly, enables an organization to be more adaptable to changes in the market and the economy. To quote the words of W. Edwards Deming, “No one has to change. Survival is optional.” Through implementation of Lean, organizations will benefit from streamlined processes, reduced waste and lower manufacturing cost. In addition, the development of a continuous improvement company culture is also an outcome of Lean. These organizations will not merely survive; these organizations will grow and given that, create additional jobs. There are certain steps involved in the implementation of Lean and various tools utilized within the Lean methodology. Although, before any improvement activities occur the Lean initiative must have the full support of management. There must be a commitment from management to provide the proper resources and on-going support to implement a Lean program that will stand the test of time. Companies will at times organize one “Lean Event” and initiate 5S, congratulate themselves and stop supporting the initiative. At the heart of Lean is gradual continuous improvement or Kaizen. An organization cannot expect to implement Lean overnight. It will require time, resources and hard work to build a robust and effective Lean program. One very important thing you must consider is training and education for your teams. Every professional sports team receives rigorous and continuous training to refine their skill-sets and coaching to keep them motivated and on track towards success. Proper training in Lean methodology and all the tools, along with regular guidance and encouragement, will greatly improve your team’s chance of success and provide for a smoother transition towards a Lean culture. Waste exists in most every process in one form or another. No matter how efficient your process currently is, it most likely can be improved. Any step or operation that does not add value is waste. One method used to discover waste is the Value Stream Map. The Value Stream Map depicts how materials, parts and processes flow through the organization and on to the customer. In addition, the map should identify how different actions and departments are interconnected. Through examination of the map, your team can identify which actions and processes add value and which are wastes. The team can then develop a “future state” map with as many of the non-value added actions and processes excluded. As you develop the new value stream, look for ways to change to a pull system where production is based on customer demand and eliminate the waste. For each of the wastes identified using the Value Stream Map the team should determine the root cause. Root Cause Analysis (RCA) is often performed through brainstorming and use of a fishbone or cause and effect diagram. Once the most likely causes are identified the team could then perform a 5 Why exercise and determine the root cause. Once the root causes for each waste have been determined, the team should put together an action plan. The actions should take into account any effects on the rest of the process. Anytime we make a change, new content is introduced into the process. Unknown content is process risk and can be evaluated by Failure Mode and Effects Analysis (FMEA). When 5S is implemented properly, it can identify and reduce many forms of waste in any process or workstation. An organized work area reduces excessive motion and wasted time looking for the right tool. The visual aspect of the 5S methodology is also very effective. When everything has a place, waste in the form of looking for tools or supplies is eliminated. Improved visual controls are implemented as part of 5S to make any process non-conformances obvious and easily detectable. Kanban is a Japanese term for a visual signal or card. Kanban works hand in hand with JIT when used to regulate production batches of parts and their delivery to the production line. In many cases, Kanban cards are used to signal the need for replenishment of component parts or supplies. When an operator or material handler pulls a set quantity of parts, the corresponding Kanban card is returned to the work cell or area producing or supplying the parts. The quantity of parts listed on the card is indicated by a color code tag and that amount is produced. In so doing, the required amount of parts is constantly available without the waste of excess inventory or work in process. Kaizen is a key building block for a robust sustainable Lean initiative. The goal of Kaizen is to improve productivity, reduce waste, eliminate unnecessary hard work and humanize the workplace. Kaizen is not a specific tool or set of tools to improve quality. Kaizen is more than a destination, it is a journey. Kaizen philosophy empowers everyone to assume responsibility of their work processes and improve them. With Kaizen, workers at all levels of the organization are engaged in constantly watching for and identifying opportunities for change and improvement. Kaizen is a culture change that supports gradual continuous improvement on a daily basis. When everyone is working to reduce waste and improve processes the organization becomes Lean. Through proper planning, education and application of the Lean tools, processes can be optimized and waste eliminated. In addition, participation in the improvement activities tends to build employee morale. When the workers are involved in the improvements they tend to feel more ownership of their processes. When this occurs you can build towards a gradual continuous improvement culture. Rather than making large expensive changes that can be disruptive to the workplace, you will begin making smaller sustainable changes. The application of Lean methodology is achieving measurable results across all types of industries. 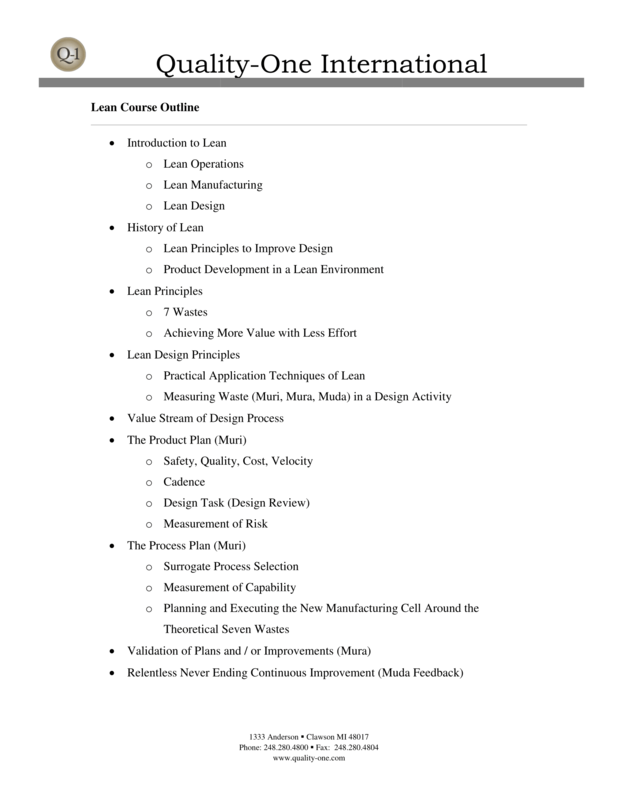 Lean methodology helps you reduce costs while delivering added value to your customers. Lean Services from Quality-One include Lean Consulting, Lean Training and Lean Support, which may include Facilitation, Auditing or Contract Services. Our experienced team of highly trained professionals will provide a customized approach for developing your people and processes based on your unique Lean needs. Whether you need Consulting to assist with the development of your Lean methodology, Training to help understand Lean tools and drive improvement or hands-on Project Support for building and implementing your Lean process, Quality-One can support you! By utilizing our experienced team of Subject Matter Experts (SME), Quality-One can help you promote the value of Lean in your organization. Quality-One offers Quality and Reliability Support for Product and Process Development through Consulting, Training and Project Support. Quality-One provides Knowledge, Guidance and Direction in Quality and Reliability activities, tailored to your unique wants, needs and desires. Let us help you Discover the Value of Lean Consulting, Lean Training or Lean Project Support.